The Council for Scientific and Industrial Research (CSIR) has developed a panoramic 360 degree Wide Area Surveillance System which would give armoured vehicle crews enhanced situational awareness, whilst allowing them to remain safely under armour. The wide area surveillance system provides a 360 degree view of the scene around a vehicle as well as the locations of threats or targets in combat situations whilst the gunner, driver and commander are safe inside their armoured vehicle. The system allows for the elimination of windows, which are often the weakest point in armour and, according to the CSIR, almost allow the crew to see through metal. The system can operate by day and night on both land and on maritime vessels. The surveillance system uses proprietary camera calibration techniques and stitching algorithms to fuse data into the output view. The calibrated cameras compensate for wide-angle lens distortion that occurs in standard camera visuals and procures a panoramic real-time stitch of the scene that is geometrically accurate. Overlapping adjacent views can be stitched together to create a high-resolution, wide field of view image. Overlapping visual and thermal frames can also be fused into a visual/thermal composite output. Algorithms used in the stitching of images are patented and part of the novel camera calibration that is part of what distinguishes the CSIR product from similar offerings, the Council said. 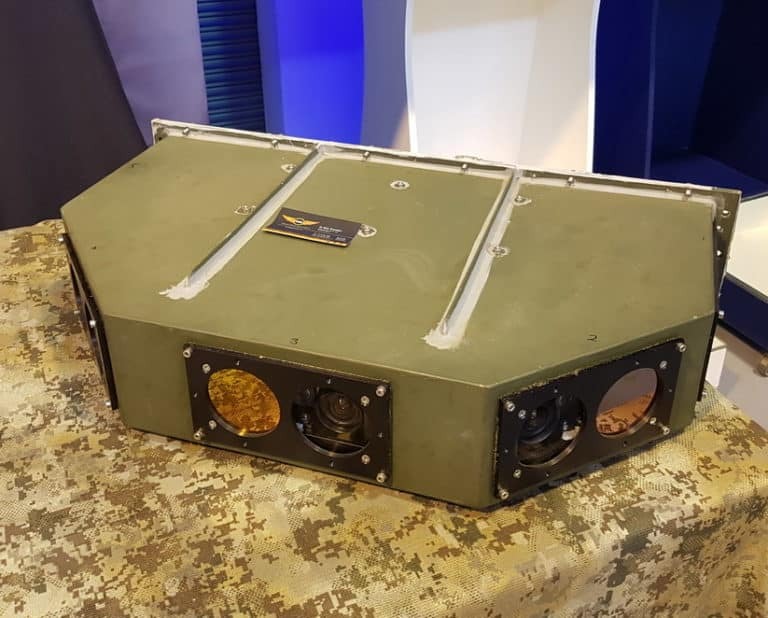 Regarding applications, the CSIR said the main users would be the army and for maritime users it provides 360 degree day and night optical surveillance that complements radar for detecting wooden pirate boats and other surface threats, thereby eliminating close range blind spots around large vessels. The system would also be of value to operators of cash-in-transit services for improved situational awareness around vehicles without adversely compromising the protection offered by vehicle armour. The CSIR is looking for partners to industrialise the system and is also aiming at the South African military – the South African Army’s future Badger infantry combat vehicle, for example, uses several different cameras rather than a single panoramic one and could be a good candidate for the vehicle.